Next Saturday, December 24th, Redemption Hill will be coming together to celebrate, sing, read, and respond to the very good news of Immanuel, God with us. This service will be based on the Service of Lessons and Carols, which was first drawn up by E.W. Benson, later Bishop of Canterbury, for use in the Cathedral at Truro. It was later adapted from early sources as a Christmas Eve service and was first celebrated on Christmas Eve in 1880, and was later modified for use at King’s College in Cambridge, in 1918, by its then Dean, Reverend Eric Milner-White. The service will consist of God’s revelation to us of God’s purpose (the lessons), followed immediately by our response to God’s word (the musical portions of the service, our offering of praise back to God). The first four lessons are passages from the Old Testament which look forward to the Day of the Lord; the day when God will finally establish God’s purpose, reject all that is contrary to it, and affirm whatever belongs to it. The fifth lesson which is taken from the Gospel of Luke directly assert that in Christ, the long-awaited day has come. As you have meditated on Jesus’ coming with your family this Advent season, we would invite you to celebrate with us on Christmas Eve as we look to Jesus. He is the way, the truth and the life. He is the death and resurrection. He is the beginning and end of all things. He is Heaven and earth reunited. He is the salvation that the prophets told us about from ancient times. He is the only way out of death. He is the only way that death can ever die. He is the Savior of the world, the one who takes away all the sins of the world, and all of that is offered to us. 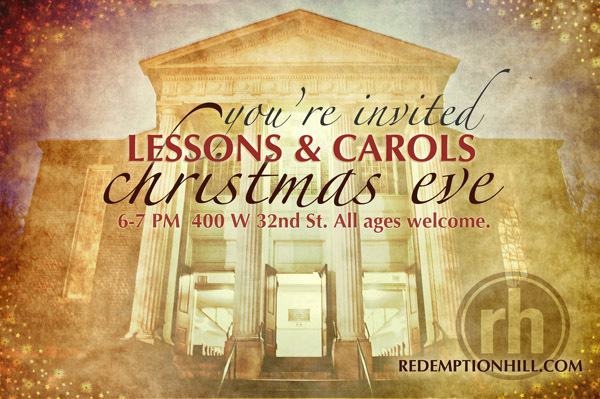 Our Christmas Eve Lessons and Carols service will be Saturday night, December 24th, at 6:00 p.m., at the Redemption Hill office. If you are planning on attending, please RSVP here and share the event with your friends, family, and neighbors. After the service, stick around for warm drinks and yummy sweets in the parlor. No childcare will be provided, but that’s on purpose. This is a perfect service for families with children of all ages to sing and celebrate together.